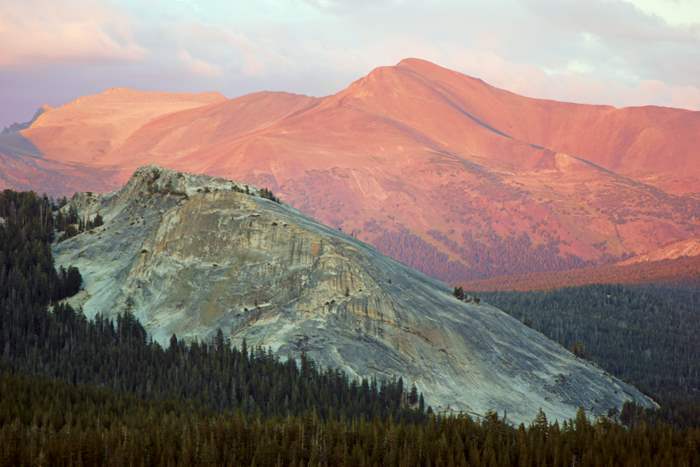 Where’s the best place in Yosemite National Park to watch (and photograph) a spectacular sunset? I’m not even going to pretend to know the answer. 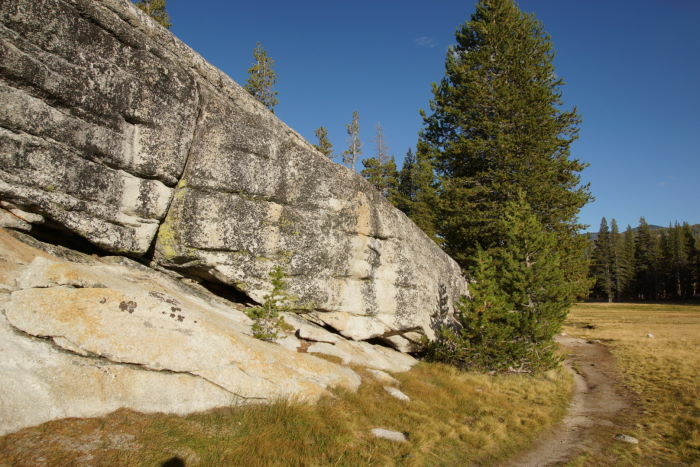 But I’m pretty partial to the place I selected: Pothole Dome, at the western end of Tuolumne Meadows, along Tioga Road. 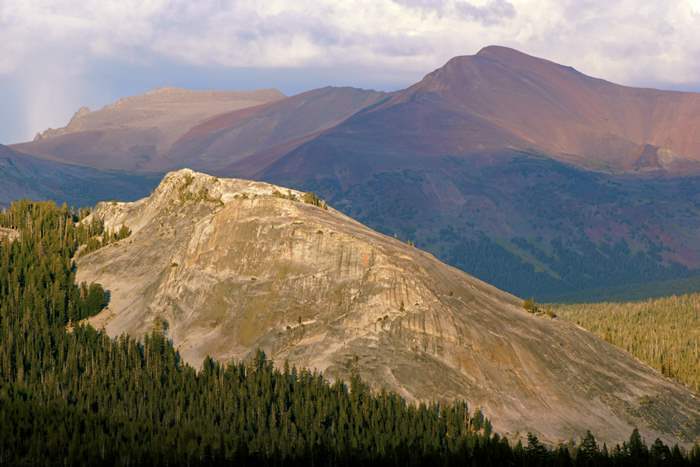 It’s easy to hike up to this high point, and it’s not difficult to get back down, after sunset. You’ll have a fairly decent view looking west, towards the sun, but the real show is to the east, as the fleeting light moves across the meadows and up the surrounding mountains. 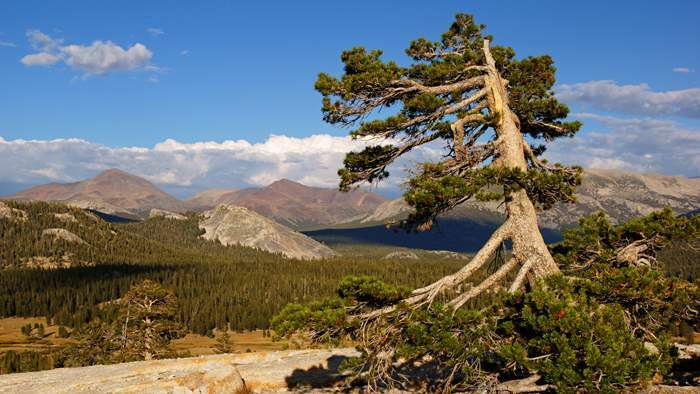 Tuolumne Meadows is located along Tioga Road (a.k.a. 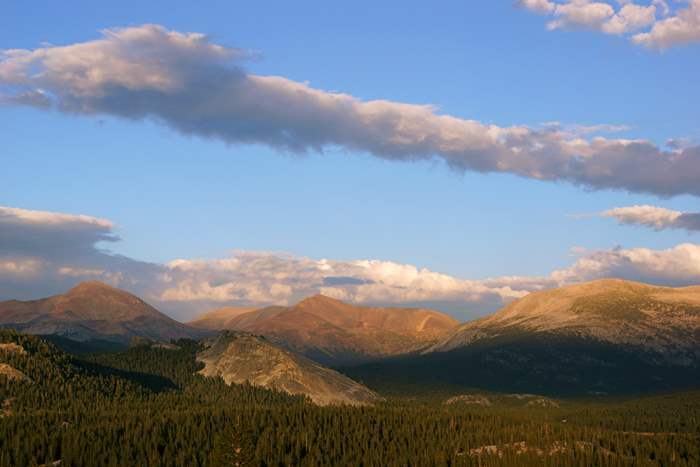 Tioga Pass Road). This road is closed during the winter and spring, until the road can be cleared. 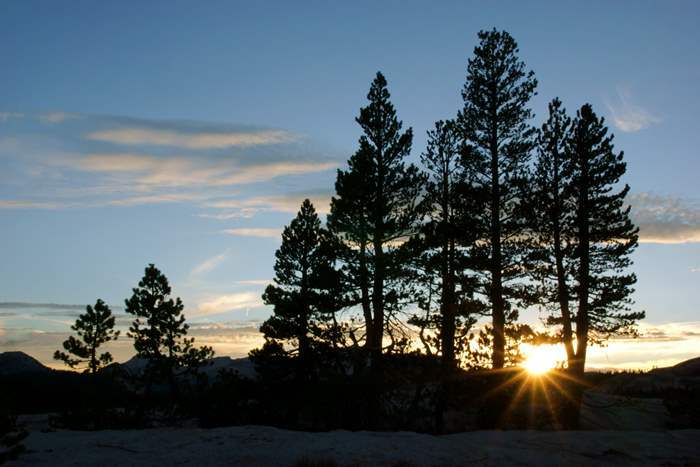 If Tioga Road is open, you can access Tuolumne Meadows from either Lee Vining and US 395 (on the east side of the mountains) or from Yosemite Valley. 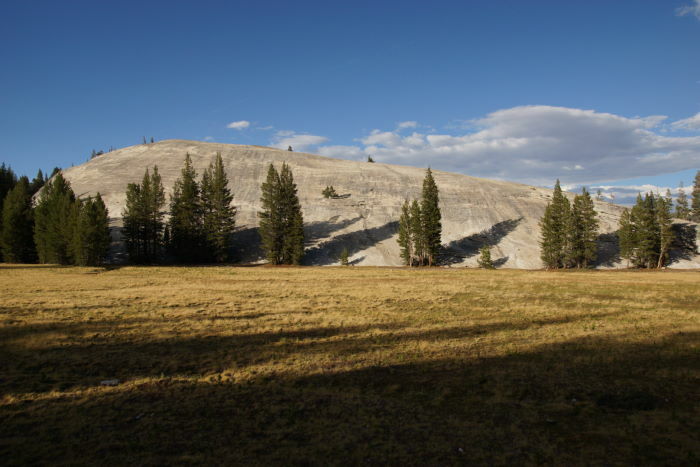 Pothole Dome is located to the west of the Tuolumne Meadows visitor center, on the north side of the road. With sunset quickly approaching, I stopped into the visitor center to ask a park ranger for advice. I was hoping he would offer a tip on some super-secret place that photographers love to go, to capture a good picture at sunset. Instead, he confirmed what I already knew — either Lembert Dome or Pothole Dome would be a good location to photograph a sunset. I chose Pothole Dome, because I was more interested in the view to the east than to the west. When you’re in the mountains, you never really see the sun set while facing west — the sun always goes down behind some hills. I knew the better display of light would be facing east, as the mountains and clouds turned pink and purple. Or at least, I hoped I was right. Pothole Dome isn’t a towering mountain. But I was okay with that. At this point in the day, I wasn’t looking for a challenging hike, I just needed enough elevation to view the surrounding area. The trail up Pothole Dome is fairly simple. From the parking lot, you circle around an environmentally-sensitive meadow, until you reach the foot of the dome. 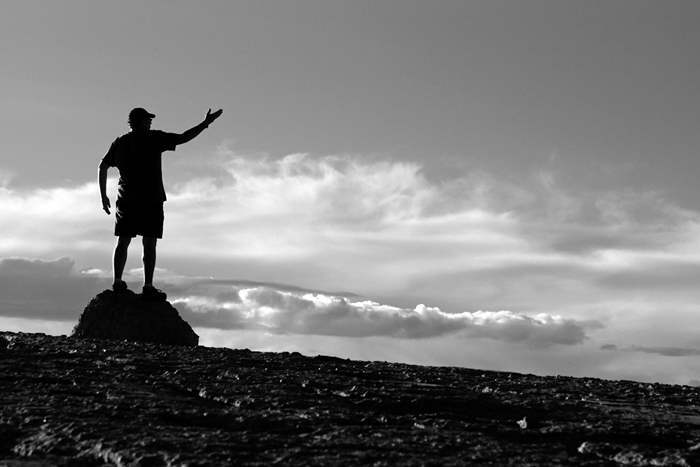 Then, just hop onto the granite and start climbing up the slope, any which way you please. There are a few interesting trees on the dome that have somehow found a way to grow in the cracks of solid rock. 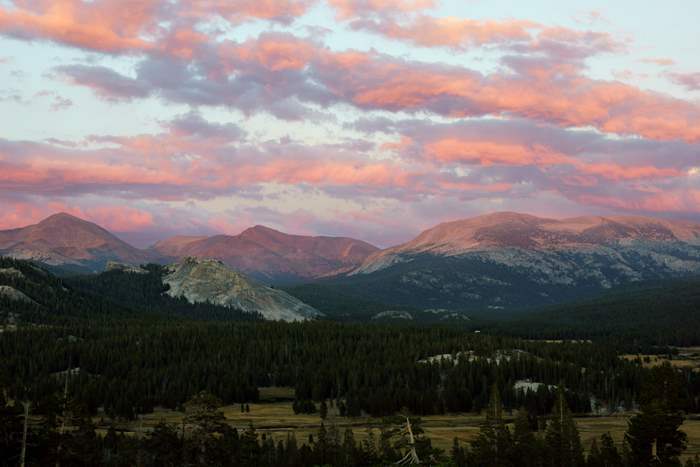 Looking across Tuolumne Meadows, I was most interested in Lembert Dome — the other option recommended as a sunset spot. Lembert Dome is higher, and would have taken longer to hike up (and down). It also would have given me a good view to the west, and the east. But, if I was on Lembert Dome, I wouldn’t get to see Lembert Dome, as I could from the top of Pothole Dome. As sunset approached, the clouds rolled in, as if on cue. 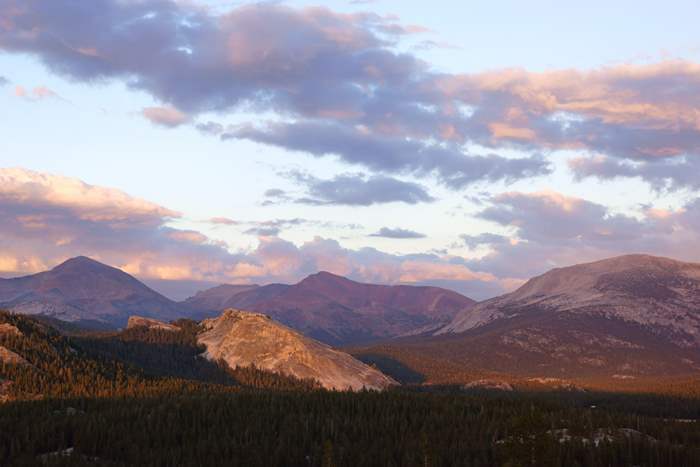 The mountains behind Lembert Dome were nicely illuminated. … but before long, the sun was gone. I figured the show in the opposite direction would soon be over, as well. But there was still plenty more to come. 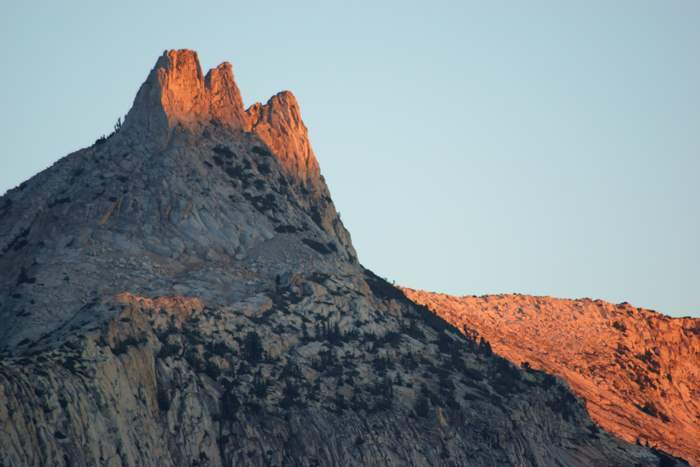 As the sun slid lower, the shadows crept up Cathedral Peak, to the south. And then, everything started changing from orange to pink and purple — seemingly when all the direct sunlight was gone. It’s called alpenglow, and wow, it was spectacular. 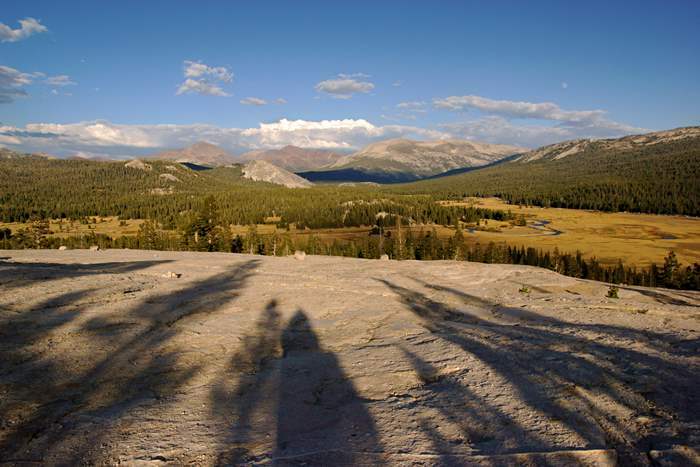 A wider view shows this magical moment, with Tuolumne Meadows down below. So what do you think? 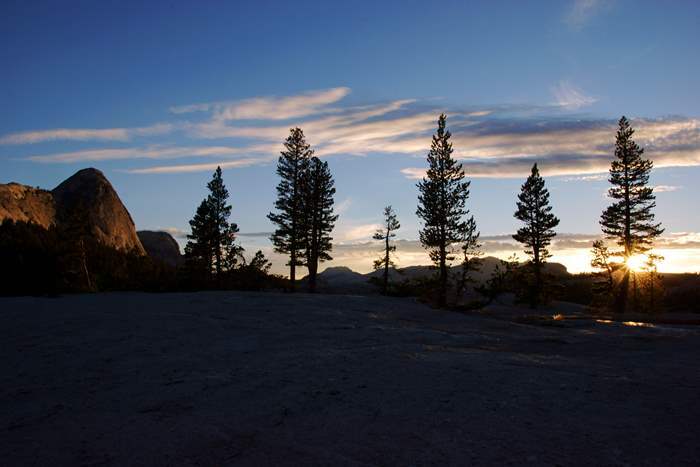 Is it the best spot for a sunset in Yosemite? Comment below! In the daytime, Pothole Dome provides a good spot for a relatively short, easy, and rewarding hike. At sunset, it’s sublime. 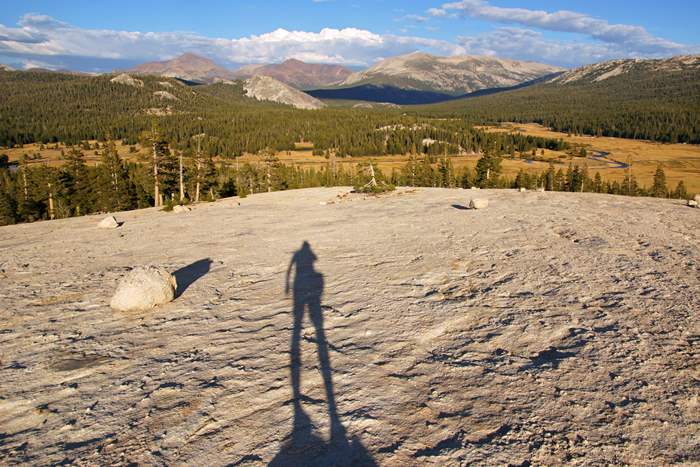 Add it to your to-do list, when visiting the Tuolumne Meadows area.